I am honored to share Dr. Sylvia Olney’s interview with you. 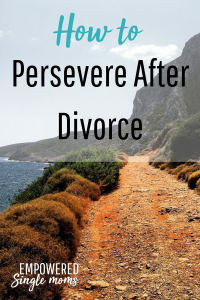 She shares how to persevere after divorce. I experienced being a single mom for two years, during which the most difficult times I faced included literally not having enough food to eat. I still find it difficult to talk about this because in the United States this is never supposed to happen to anybody and I am still tempted to feel ashamed about it. My husband and sons’ father had left us and at the time I only had Australian citizenship. When I applied for food stamps, the social worker suggested I go back to Australia. I had neither the means to do that, nor did I want to give up on the schooling I was involved in, the jobs I held, or the friends I had. Although I had grown up as an immigrant in Australia and came from a large family, I had never experienced real hunger before. It was frightening. By the time I went to see a social worker, I had lost my house to the mortgage lender and my oldest son had totaled our car after I had just made the final payment on it. The next car I was able to get through the insurance reimbursement was repossessed after I made one late payment. I was getting to and from the university where I was studying and working two part-time jobs by bus, wearing my oldest teenage son’s cast-off jeans and shirts, and basically living on rice and beans. At one point, our electricity was shut off and I was supposed to appear in small claims court. I didn’t know where to turn for help and my church forgot about me once my husband was no longer around. I was also too proud to directly ask for help from them. My oldest son, at sixteen, understood what was happening. He almost failed out of high school working as a short-order cook in a local diner in order to help bring in cash. Although my sister lived in the same city as us, she believed I was making the wrong choices by staying in school and working only part-time jobs. However, I had lived in the US long enough to understand that education was the key to getting out of poverty. She would not help me at all and I have had to work hard to understand and forgive her. I learned so many things during that time! I learned that I was stronger than I had known. I learned that my tenacity and vision were personal gifts and that if I just kept putting one foot in front of the other, I would get somewhere. I learned that women make the most amazing friends because of our ability to create relationships and networks, and that we are more likely to live in touch with reality. Women are strong because God made us that way so we can raise the next generation. I learned that there is no substitute for hard work and that if I have a vision, it’s true that the world will meet me there! I learned to be independent. I also learned to live within my means and to enjoy life just the way it presents itself. I learned that I could get along with very little and still experience joy and happiness. I learned that, just as my grandmother used to say, “When the time comes, you will know what to do.” And I learned to take reasonable chances and not always be so cautious. I have learned that life is mostly good. I persisted with my university education, switching to a major that would make me more employable, and continued working part-time work-study jobs. I took out student loans, trusting that I would be able to repay them. I prayed for guidance. I established a relationship with a counselor at the university where I was a student and tried to keep life as normal as possible for my sons. I attended their baseball games, made dinner at the same time every evening, and sat down with them to do homework. I made friends with other single mothers in my classes at the university and learned more about coping. Finally, I went through with filing for a divorce. My husband had moved to another country, so there was no way to insist on child support payments but I learned to live very frugally. After a year on my own, I met a man at an academic conference who seemed to have the makings of a friend. He respected women, had been married for a long time like myself and was now separated, and was looking for a teaching job, having just completed his doctorate at the university where I was studying. We began to email each other, which at the time was a new way of communicating, and it became an email romance! After another year, we started dating seriously and eventually moved in together in order to save resources, thinking of this as a social science experiment. He also had two sons in tow. We didn’t know if we could make it work. At the time, there were very few books on parenting stepchildren or on blended families and we didn’t have the time or money for a family counselor. The following year, we got married very simply in our backyard. Everything was decorated with flowers from a farmers market and a justice of the peace presided. We wanted to model commitment to relationship to our children. We have been together longer now than our first marriages lasted, and I consider meeting him as a great blessing in my life, something I could not have engineered. The early years of our marriage were difficult financially until we landed professional jobs, but again it was persistence, a conscious commitment to our values, and a vision of what our lives could be like that has made the difference. A great spiritual teacher I was exposed to as a teenager used to say that we need to “work as though it all depends on us, and pray as though it all depends on God.” I think that this is key. I went on to graduate with two master’s degrees, one in psychotherapy and counseling, which made it possible for me to work in professional settings including college teaching as an adjunct professor. Earning my doctorate made it possible for me to teach university. I would send out my resume and receive offers to teach and then the positions started finding me without effort on my part. That’s how eventually I was recruited to teach at a university. This is also where I see the hand of God: We can have all kinds of plans ourselves but there also seems to be “time and chance,” as some people call it. I did not foresee that the bulk of my career would be college teaching, but I loved it. I have always maintained a psychotherapy practice and continue to enjoy encouraging people who need emotional support (see my healing website at www.clearwatershealing.com). These days, I also work as a lay preacher (another opportunity that took me by surprise) and I am also a consultant for a wonderful skincare line (solney.myrandf.com). For a long time, my motto was “Just say yes!” (to reasonable things, of course! 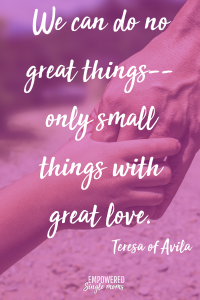 ), but these days it is also, “What would make life more wonderful–for you and me both?” The second quote was inspired by Marshall Rosenberg, the inventor of nonviolent communication. I accept invitations to speak and teach, occasionally run retreats, and assist others with psycho-spiritual educational groups such as recovery from grief. I am not always paid for what I do, but I love my life and the opportunities that arise in it and feel that I am fulfilling my purpose. If you are in the beginning stages of separation and divorce, I recommend getting professional advice and support, which does not always require money. One resource, for example, is Legal Aid. Don’t go it alone and don’t be too proud to ask for help–get to know other women in the same situation. There are many competent and knowledgeable people who understand the pitfalls after divorce, which, in the US, include the possibility of poverty unless you are already in a professional field that will support you and your children. Learn about your legal rights for financial support by your ex-spouse. Consider using mediation rather than a lawyer. Mediation entails only a couple of hundred dollars at the most versus thousands through the court system. Know that you can file for a divorce yourself, including obtaining the necessary papers from your local courthouse or city hall. Do not even consider returning to or staying in an abusive marriage unless your partner commits to going through long-term psychotherapy. And realize that your family of origin may not be supportive of your decisions even though you are an adult, which is another reason to get to know other women and support systems. I enjoy reading books about spiritual topics, such as the works of Cynthia Bourgeault about centering prayer and Christ. Currently, I am reading The Personhood of God by Yochanan Muffs. I also recommend studying books about managing one’s emotions and how to create functional relationships, such as John Gottman’s The Seven Principles for Making Marriage Work. family members, friends, and colleagues with love and affection, seeking to be of service in any way we can. And we are doing something great when we do not leave ourselves out of the picture, which many women tend to do. If we cannot even treat ourselves with kindness, the odds are not good that we can behave this way with others. I love the question, “What do you think makes life worth living?” At this point in my life, it seems to me that the answer is “relationship.” It may seem that I am referring only to people, but I mean everything that arises in our lives. So, instead of defensively withdrawing from things and people and situations, I think that we need to engage them consciously and make decisions on that basis. In this way, reality itself becomes a source of healing as we practice trust and courage. I suppose I am talking about “showing up” for life. Sylvia Olney was born in Germany and brought to Australia by her immigrant parents. She was educated in Australia but went back to Europe to attend college. There, she met her first husband, gave birth to their two children, and helped to manage three church parishes. Eventually, Sylvia and her family emigrated to the US, where she returned to college and created a career in teaching and counseling.